Malay traditional food made by Malay people in Malaysia. Malay traditional food in Malaysia is naturally made by the Malay people. Malay as a race is divided into many smalll "tribes" or ethnic groups (for example: Acheh, Bugis, Mandailing, Minang, Banjar, Pattani or Jawa). Malays in Peninsula Malaysia originally come from all over South East Asian archipelago. Intermarriages among these ethnic groups result in a rich food culture. So, each tribe has their own spread of traditional food that is typical to their respective villages. Oh, what a spread they are! Once Malaysia was formed, the diversity of its Malay traditional food are recognized mainly by its geographical location, according to the states. On the west coast, the northern states are well known for their hot, spicy food. This is due to heavy influence of neighboring Thailand. The central part by its rich gravy and the southern states by their thick and sour spicy sauces. 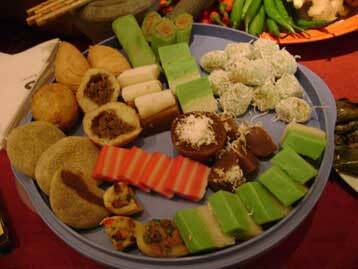 The east coast states on the other hand, is more associated with sweet, but rich fare with glutinous rice. However, the true Malay traditional food, in my opinion, should be prepared using only local ingredients. The spices and herbs are grounded manually, the meals are cooked over ancient-styled oven or stove, stirred with traditional utensils, packed or served in tropical edible leaves, eaten using the hand, following Malay etiquette and table manners. taste and also the kind of ingredients used. Some of the more well known heavy fares are: lemang (glutinous rice cooked in bamboo pole), ketupat (glutinous rice cooked in pandanus, coconut or banana leaves) and nasi dagang (3 part rice to 1 part glutinous rice steamed with ginger, onion and fenugreek). Breakfast items included pulut inti (steamed glutinous rice with sweet coconut topping), boiled tapioca served with grated coconut, nasi lemak (rice cooked in coconut milk) and various sweet and savory dainty Malay cakes (kuih-muih). Fish crackers (keropok -- made with sago and fish, prawns or other seafood) are popular snacks. There are several types of keropok, the more common ones are dried before frying but keropok lekor which originates from the East Coast were boiled before frying. 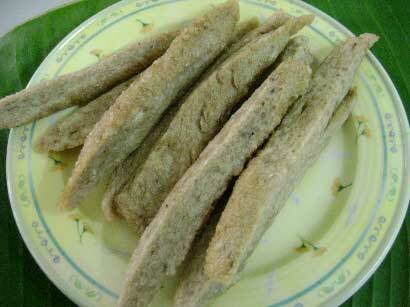 This type of keropok does not have long shelf life (two days at the most). However, the good news is, unfinished keropok lekor, after boiling, can be sliced thinly and turned into the normal dried keropok by drying the slices in the hot sun. Ingredients used are mainly rice, rice flour, glutinous rice and its flour, yam, tapioca, sago, sweet potato, bananas, molasses, palm sugar and the ubiquitous coconut, prepared in its many forms. And of course the local herbs and spices! Many, many types of them and they are used in large quantities. Good cooks are never afraid to use large amount of these spices. This results in dishes which are rich, fragrant and redolent with beautiful concoction of spices. Since most of these tropical products do not last long once they mature or ripen, the ancient cooks created ways to preserve them by drying, fermenting, salting, smoking or turning them into flour and pickles. And here we are, moaning whenever there is a power cut such that our freezer is not working! So, you see, Malay traditional food mainly use local produce that can grow easily and abundant in this land. Please bear in mind that wheat and its by-products were brought in by the western colonial powers so traditional Malay food does not have them. Therefore, leavened bread is not part of traditional food. Instead, crepe-like delights like "lempeng" are made with bananas, molasses and garnished with coconut shaving. Tapioca are finely grated and used to make delicious sweet cakes which are baked in a tin over and under smoldering coconut husks. Ahh, what a wonderful smell emanating from those burning, smoky contraptions. I simply love Malay traditional food. 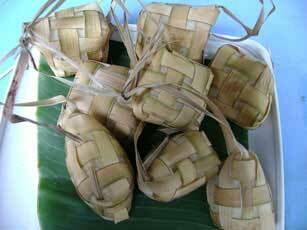 These rice packets (ketupat) were woven using young coconut leaves. They are then boiled for at least three hours before you get to eat them. This version uses normal white rice. Typical ways of cooking includes roasting, frying, steaming, boiling and also stewing. Fuel used is made up of local firewood or coconut husks and coconut shells. Making Malay traditional food with these natural fuel do taste much much better than by using conventional LPG and a modern stove! Bamboos are shaped as skewers and used to hold barbecued dish or meat. Like mentioned before, bamboo poles are also used to contain food and then cooked. Usually, the bamboo is lined with banana leaves before food is stuffed in, this makes the food smell more fragrant as well as prevent the itchiness of the bamboo to contaminate the food. 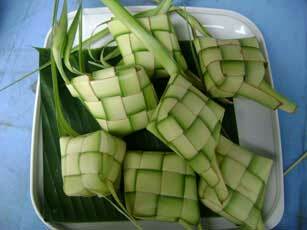 Ketupat palas (made from leaves of a member of pandanus family). This version uses glutinous rice. Banana leaves are used to pack food, to wrap meat or fish before roasting and also for serving. The leaves were first smoked over fire to make them soft, otherwise they would break and would not be able to contain the food. This also makes the food smell very nice. Coconut leaves are weaved to make the case for ketupat (rice cakes). Only young coconut leaves are used in this case because the older leaves are bitter and will affect the taste of the food. 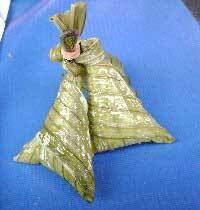 Yam leaves, banana leaves or rubber plant leaves are used to wrap "tapai". Tapai is fermented glutinous rice or tapioca which takes some acquired taste to enjoy. Old ways of fermenting is used to make tapai and tuak. Tuak is a mild alcoholic drink made by "strengthening" the juice resulted when making the tapai. Another drink worth mentioning is "nira". Nira is made by collecting the nectar of coconut flowers. The nectar drips slowly into short bamboo tumblers tied around the the top of coconut trees. The drink is really, really sweet. 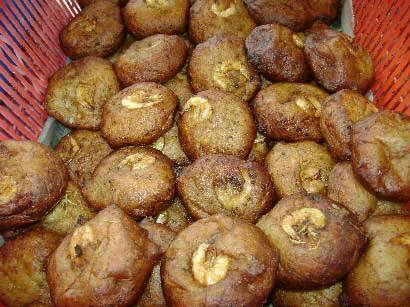 By cooking nira slowly, it would turn into thick palm sugar. The names of Malay traditional food also implies the uniqueness of the meal. For example "nasi dagang" literally means: traveler's rice. The nature of the rice is that it can last for a couple of days thus giving it its name. "Rendang" means "wok" and any rendang means exactly that: the food is stewed over long period in a wok. If you thought after reading the description above that most traditional Malay food are pretty unhealthy, you are quite right. However, we do have our antidotes - the traditional herbal food which are used concurrently to balance the "heaty, windy or cold" stuff. The Malays eat plenty of raw herbs to consume with daily meals. These are called "ulam". 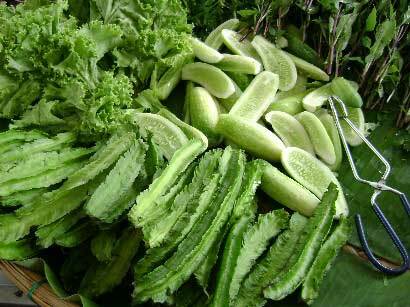 Ulam comprised of young shoots or leaves of various plants which are mostly eaten raw or sliced thinly and made into salad or eaten with sambal belacan. Most of them taste bitter, but in the Malay culture, the bitterness is the cure. The Malays also believe that daily consumption of ulam would make you look younger even though you are actually aging. These herbs and raw leaves grow everywhere easily. They are cheap and available. Modern science also has proven that some of these plants do indeed contain high levels of antioxidants and also phyto-chemicals. A lot of private homes have small yards that are used to plant these herbs and spices. In Penang, however, there is a special place called Tropical Spice Garden at Teluk Bahang which showcases many herbs and spices native to the island. Do try to visit when you are in Penang. I also live in Penang and am now holding a regular traditional cooking classes at the garden. In this modern world, some of traditional Malay food are indeed dying or have already been abandoned. It is up to the Malays themselves to uphold the tradition. One of the ways is to keep on asking your grandparents about the kind of Malay traditional food they ate when they were young. Also, to observe the rituals performed in some ceremonies which are very closely related to traditional food preparation. Banana is Malay traditional food, it is a nutritious and widely available.